Our holiday property is located in pristine palm groves surrounding, just a stone's throw away from the world famous Palolem Beach. Goa is a heaven to lovers of sun, sand and the sea and Palolem beach is paradise for sun tanners, nature lovers and swimmers who love the safest beach that Goa has to offer. The beach huts at Shawnel Beach Resort are completely eco friendly and made out of natural products that nature has bountifully provided. 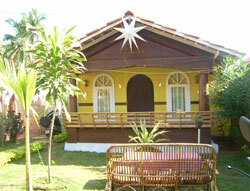 The main structure of the palolem beach huts are wooden. The base and the walls are made of different wooden materials that are down to the earth and natural. The beach huts at Palolem's Shawnel Beach Resort are rustic and romantic with wooden walls and red teracotta earthen Mangalore tiles on the roof. Keeps the unseasonal rains and the daily beach heat naturally away. Tourists have a choice of 12 different huts facing the Palolem beach and just 100 meters distance away from getting your feet wet in the crystal blue sparkling water of the Arabian sea touching the Golden sands of Palolem beach. Palolem Beach just 100 meters walking distance. We at Shawnel Beach Resort guarantee you a truly down to the beach experience in down to the earth wooden huts which are highly rustic and romantic. Decently comfortable & natural beach accomodation right in the heart of Palolem beach we welcome you to experience a luxury beyond words can express. We welcome you to come as a guest and leave as a friend. That's the magic of Palolem.